Tamales from Texas. The real thing, available in Louisiana! If you’ve left Texas, or even if you haven’t, you know how important tamales are. But they can be laborious and time-consuming to create at home. The solution? Texas Tamales! Spring is finally here, at least, according to the calendar. And that means all kinds of wonderful things, like asparagus, bike riding, and Daylight Savings Time. If you’re not in a part of the US that’s snowed under right now. Lots to tell, let’s get started. Ok, so, last year I did what has long been told to me, I got what I thought was “local raw honey” to help with allergies. Honey from your area works similar to an allergy shot–it de-sensitizes your immunoglobulins to the pollen and allergens in the area. (An allergy shot actually tamps down on the histamine response, but doesn’t de-sensitize.) Well, I went back to the same place I went last year, and bought some more of the same honey, which didn’t work. (The place is subject to an upcoming blog post.) Well, I was explaining to the clerk (around sniffling and sneezing) that I needed it for allergies. It didn’t work last year, but everyone told me it would! Well, I was going through two or three kinds of OTC allergy meds last weekend, and it made me downright grouchy (and swearing at BF again.) I explained this to the clerk, a nice older lady, who said, “where do you live?” I told her. She asked, “then why are you buying honey from Ponchatoula?” Cause it’s local! Well, it’s not local enough, she said, and the honey right next to it came from–surprise–my neck of the woods, and it was a dollar less. (It was also a smaller bottle.) Honey and money was exchanged, and now I have truly “local” honey. She also told me about some locally made elderberry syrup that people were buying for not only allergies, but flu. Three local schools have been closed because of flu outbreaks, and people are buying this elderberry syrup along with the honey. This magic concoction is thick and really sweet. I bought a bottle of that as well, at $21.99 for a 16-ounce size. It’s tasty, too. I’ve never heard of Andi Lynn’s, but they’re in the Baton Rouge neighborhood of Walker. I’m glad to know about it, and they also have some homeopathic allergy drops, which may or may not be in the place I bought the syrup. Next time. On top of that, one of my Buddhist friends gave me an essential oil mixture to try, and I’ve been rolling that on at night. He loves me. But sometimes he doesn’t understand. I explain. BF asked, “what’s the deal with the local raw honey?” (He doesn’t have this problem, because this is his “native area.” Not mine.) It’s like this: the bees from your area are sucking on the flowers that are around you. When you ingest their honey, you ingest some of that pollen to de-sensitize yourself from those allergens. But if you’re using local raw honey from Ponchatoula–or Texas–you get the stuff from those bees, and they’re sucking on the flowers over there. That’s not going to help you if you’re not in Ponchatoula, or Texas. (I still have a half-bottle I bought from a vendor at the Nassau Bay Farmer’s Market.) By getting the honey and pollen from the bees sucking on local flowers from the area in which you live, you get the local “neighborhood” pollen to help alleviate your allergies to the same pollen. Make sense? I can’t say what’s exactly working, but I’m a LOT better! Still a bit of sniffling and sneezing, but not like it was. Finally, I got the right stuff. Nick Usborne at Coffee Detective has found a new way to make your coffee when you’re walking out the door: The Barista Cup. No kidding, the darn thing makes your coffee start to finish in a specially designed cup. Just chuck everything–grounds, sugar, milk, etc., into the cup, then pour hot water into it, and off you go. At $25, they’d better be worth it! I don’t have one myself, yet, but of course, because Nick says it “works as advertised,” I’m extremely interested in getting one. After all, Nick’s the one who originally taught me to make iced coffee. (Note: these aren’t available on Amazon, only on the company’s website.) And Nick considers himself a coffee expert, and writes about it as a side thing to his web copywriting business. The Barista Cup company has an office in the UK and in Winter Springs, FL, so they’re multinational, and working on saving the planet, one cup at a time. Don’t you just WANT one? It’s a toy, and it doesn’t actually make real coffee, but it does make the gurgling sounds of a certain type of coffee maker. I halfway considered buying it to annoy BF. Yes, more than two years after I asked, PLEASE, our little corner of the world got baskets with coffee holders. Just one, because after all, you only need one, right? HEB baskets have two as well, but some of the smaller baskets at Winn-Dixie only have one. Even with BF, I’m the only one drinking coffee anyway. They still have the full-size baskets without them, and everyone uses those. These are smaller, kind of like the ones we saw back in the 70’s with a shallow basket area. So now when I visit Winn-Dixie, I can get my coffee at the nearby PJ’s first and head on in to grocery shop. Our store doesn’t have as many of these, and it seems like I’m the only one who knows what they’re for, so there’s always one available for me. Thanks, Winn-Dixie! You know how one day, you just want something? Over the holidays, it was tamales. And I didn’t take pictures. Now, for those of you not of Hispanic or Texas descent, you might not know that tamales are a bit of work. So much so that many Hispanic families make the tamales only at Christmas time. Other times, they rely on buying them, or finding a good “tamale lady” or abuela (grandma) who makes them for sale all year long. Because, let’s face it, when done correctly, tamales are delicious. In Robb Walsh’s The Tex Mex Cookbook, there is a picture of President Gerald Ford on the campaign trail in Texas eating a tamale. He was at The Alamo in 1976. Unfortunately, none of his aides (or any locals) told him that you take them out of the corn husks first. They’re steamed in the corn husks, which are like a really tough paper, and you take them out to eat them. The most awesome Stephanie O’Dea sent out an email one day with her recipes for tamales in the CrockPot. With a name like O’Dea, she’s probably about as Hispanic as the Irishman from El Paso. Intrigued, I informed BF that we would be having tamales for Christmas dinner, (it was just us two) and that was it. Well, and whatever else we wanted. I set out to find the ingredients that were staples in every grocery store I ever went into in Houston. After paying $6 in Whole Foods for a bag of masa harina that I discovered in the local WD for $3 or so, my district leader OR told me that Walmart has an entire section of Hispanic goods. Well, what do you know, they had everything, and I grabbed the corn husks before anyone else did. I also had a nice conversation with two young men who were driving from Mandeville to Brownsville, TX. I told them next time they went into HEB, to think about me. Obviously, I wasn’t about to use hydrogenated anything, but I did have an unopened jar of Epic Pork Fat in the pantry. It came with me from Houston, when I went to the closing of the Webster Fresh Market. Fortunately, it’s readily available at Whole Foods. I think Rouse’s has it, too, and I have since bought a fresh jar that’s in the pantry. I had a few pieces of chicken that I roasted and cut up small, and followed Stephanie’s directions to the letter, otherwise. Well, I pulled out my stand mixer, and mixed the masa until I was sick of hearing the motor run. Little bits were flying out of the mixer if I ran it too high (next time, maybe half?) Guess I need a pouring shield for it. Balls of masa never floated, and I finally gave up and used it as is. I made the components in the days before Christmas, and BF sat down and helped me put them together. It didn’t take too long, and we only had about two dozen, but that was OK. Verdict: they tamales were good, but a bit bland, and Stephanie admits that. It was the first time I made them. We had some of the filling and masa left, which went directly into freezer bags and into the big freezer. I have permission to jazz them up if I ever make them again. Chorizo, maybe? I subbed out the stevia extract with erythrytol, but next time I’m going to get me some stevia extract and start using it. BF liked it–it’s quite rich–but it wasn’t quite sweet enough. Low carb, much dairy, no wheat/gluten/flour. I’m done with yeast free for a while. My regular Buddhist activities are at least an hour’s drive away. I commonly go to the Mandeville area, which is still on this side of Lake Ponchartrain, and 90 minutes from New Orleans. That’s OK, and I get to go to Whole Foods, Bed Bath & Beyond, or wherever else I want to go that we don’t have nearby. Additionally, if I shop right after the meeting, I’m not too tired like I am when I make it to Hammond. So I frequent the Target in Covington, since it’s on the way home, and there’s a Cost Plus World Market next door and a Starbucks in that Target. This little muslin bag holds some of the most delicious food available. OMG!! THEY’RE MADE IN HOUSTON!!! Not knowing what to expect, I bought a bag of the Beef Tamales. There are also pork, chicken and black bean available at Target. How did I miss these all this time? After examining these closely, I sent a text to BF telling him that dinner the next night was covered, and it was a surprise. He doesn’t like when I tell him that, but he’s patient and will try something once, so he says. I brought them home and told him ALL about the tamales. He gave me the usual, “sure, Honey, I’ll try anything you make” comment with a pensive (read: slightly scared) look on his face. If we decide the night before that tomorrow is “tamale night,” then I’ll take them out of the freezer and leave them in the fridge for the next day where they thaw a bit. You can also cook them right out of the freezer. Verdict: absolutely delicious, the way a tamale should be. I didn’t take many pictures because we were too busy stuffing our faces with them. Yes, we found a winner for me AND for BF. Since then, I’ve discovered that Rouse’s sells them for about $8.50 a pack, and another place sells them for $10 a pack. So when I know I’m going to Covington, and I have enough money, I buy a few packs for the freezer since they’re priced better at Target. However, I’m glad to know that I can get them in Hammond if I can’t get to Covington. 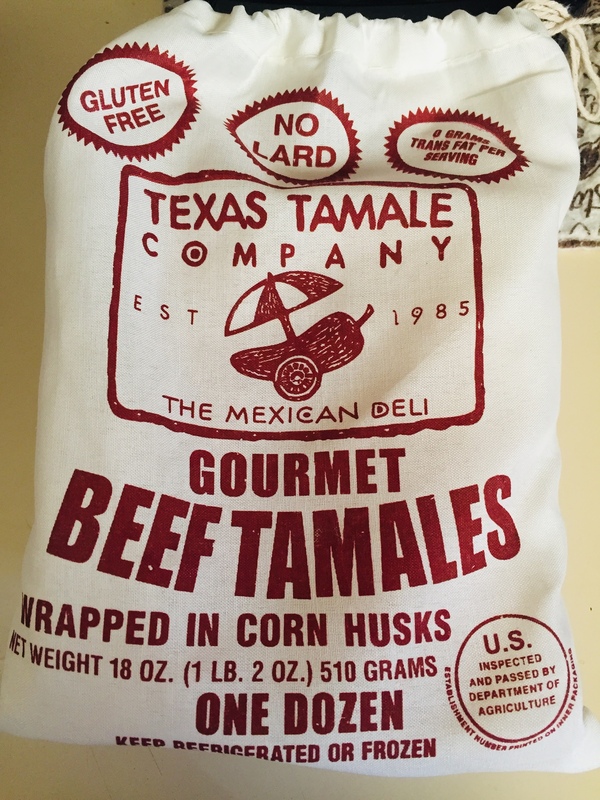 Our big freezer has a stock of them now, and a tasty tamale dinner is just 20 minutes away. The chicken, we found, was a bit too spicy for us, but the beef and pork are spicy enough without being overbearing. We haven’t tried the black bean type, because BF doesn’t want to. I eat six, he eats four and saves the other two for later. Or we eat four and split the other two later. Or he leaves the rest for me, because I bought them and I’m in love with them. They’re that good. Look, when you live in Texas, tamales are everywhere, right? Just like kolaches, chips & salsa, and big bags of masa harina and corn husks. Hatch chiles in nearly anything. It’s like the furniture, Texas flags and the Texas star decor–it’s always there. Move out of Texas, and you suddenly miss everything. Longtime readers know that I’ve missed everything Texas since the day I got here, and we *still* haven’t made a trip back to visit for a handful of reasons (mostly time and money, we always have one but not the other.) I still want to go, of course, and visit, (not to mention shop) but I can at least have real Texas tamales whenever I want them. The Texas Tamale Company is on the west side of Houston, and has been in business for many years making “gourmet” tamales. Well, after 30 years, they’ve become quite the company, and you can find these magic morsels nationwide. They even have Hatch Chile Tamales, although they’re not available here, yet. (That’s my next “ask for” project.) You can read their story here. HEB has its own brand of tamales with some interesting flavors, including Asiago cheese. I’ll try to get some of their interesting flavors whenever I get to shop there again. Understand that I have no problem driving to the Clear Lake Blvd HEB and buying my regular groceries, even if it’s a ten hour round trip. Easier said than done, of course. BF would probably not like me to do that, either, but I can be tempted. If you can’t find them locally, you can order them online. I haven’t tried ordering them yet, but I’m probably going to do that one of these days if I can’t get Rouse’s to carry the Hatch chile type. Personally, I think it’s wrong, but they could be pretty good. They’re also twice the cost of Texas Tamales (at Target), but we might try them one day. I know, shop local and all that. Subject of an upcoming blog post, honest. Since then, when we decide break open a pack of these Lone Star State wonders for dinner, I walk around singing, “Ta-MA-LES!” to the tune of Dean Martin’s Volare. I haven’t re-written the words, I just sing that part of it. So are you ready for some delicious Tex-Mex in your life in 20 minutes? Whichever tamales you choose, just remember to unwrap them from the corn husks first. This is a great post, full of information! So glad you found the Texas Tamales! 🙂 I am going to try out those you found too. And the allergy solutions! Really interesting about how to select natural honey products which should come from your local area! Who knew?! Thanks for sticking with me. You’ll love the tamales, too!